The tough-talking President of the Republic of the Philippines, Pres. 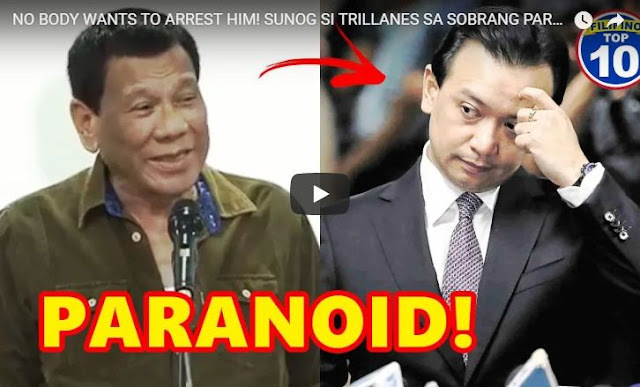 Rody Duterte slammed Sen. Antonio Trillanes who continued to take refuge inside the Senate for fear of being arrested and noted that nobody is interested to arrest Trillanes. According to Pres. Duterte during a press conference in preparation of the onslaught of Bagyon Ompong revealed that nobody is interested to arrest Sen. Trillanes and even the military is not interested to arrest the controversial senator. Pres. Duterte was quoted as saying "Nobody is interested to arrest them, the military does not have the interest, I do not have the interest, he can stay there as a boarder, the police, sabi ko do not arrest until there is a warrant of arrest by the court, eh wala man ang military, it does not constituted the martial law court, so it's only the civilian court, wala naman order, so if walang order wag n'yo nang pakialaman." Pres. Rody Duterte stated. The very first President from Mindanao also noted that he is free to stay in the Senate as a "boarder." The statement of President only proved that he is indeed following the rule of law according to some political analyst because he is still waiting for the Lower Court to decide on Sen. Trillanes case and he is not insisting on his proclamation earlier. Sen. Antonio Trillanes have been staying inside his quarter in the Philippine Senate for more than one week already allegedly using all the amenities and equipment of the Senate at the expense of the taxpayers money according to some netizens on social media. Spox Harry Roque also echoed the concerned of some netizens about the possibilities of Trillanes of using up the Senate's electricity and money with his stay in the Senate. Pres. Rody Duterte also insisted on an alleged plot to oust him, hatched by the Left, the opposition Liberal Party (Yellows), Magdalo Group but not all of their members.